Good buildings, landscapes and cities provide the physical setting for inspired human action. They frame, facilitate und enhance our daily lives in the same way that badly designed buildings, landscapes and citites hinder our constructive participation. This book «Implicate & Explicate» is about a variety of projects across culturally diverse portions of the globe that instantiate the desire for positive change. What these projects have in common is a commitment to design excellence despite constraints of budgets, resources, climate, technology and politics. They share this commitment as one of the necessary tools for societal betterment. 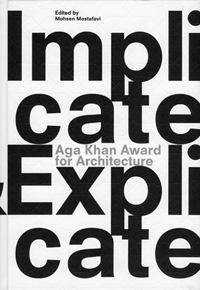 For the Aga Khan Award for Architecture, design excellence is not limited to the aesthetic and formal aspects of a project; it is the combination of advances made in disciplinary knowledge and the spatial qualitites and everyday performance of a building that sets the preconditions for design excellence. Disciplinary advancement in architecture incorporates many issues including aesthetic, sensory, technical, formal structural, material and cultural concerns. Equally, the concept of spatial performance is based on a deeper understanding of buildings and their use. It transcends mere technical performance and attempts to present buildings, landscapes and cities more broadly as the location of human activity and habits. This is the reason for the emphasis of the Award on social improvement through design excellence. Small projects often have a major impact within a community, and this fact accounts for the scalar variations as well as the diver-sity of projects selected in this cycle of the Award. Modest endeavours take their place next to ambitious undertakings. The Award is keen to acknowledge the value and beauty of these artefacts and to recognise the need for a multiscalar approach towards reshaping the environment. *Mohsen Mostafavi, Architect; Dean of the Graduate School of Design, Harvard University, USA. Lars Müller Publishers, Baden 2011. Der «Aga-Khan-Preis für Architektur» ist ein von Karim Aga Khan IV. gestifteter Architekturpreis für Architektur- und Restaurierungsprojekte mit besonderer Wirkung für das Gemeinwohl, mit Fokus auf Gesellschaften, in denen Muslime eine signifikante Präsenz haben». Der Preis wird vom Aga Khan Development Network verliehen und gilt als der grösste seiner Art weltweit. Der Aga Khan Award wird in Dreijahreszyklen an mehrere Projekte und ihre Architekten verliehen. Auch wenn die meisten Projekte aus der muslimischen Welt stammen, kommen die für diese verantwortlichen Preisträger auch aus nichtmuslimischen Ländern. Jury und Lenkungsausschuss für jeden Zyklus setzen sich aus einem internationalen Pool an Architekten, Intellektuellen, Wissenschaftern, Künstlern und Experten aus der Entwicklungszusammenarbeit zusammen.